An antidote to anxiety. A sleep-aid. A natural alternative to Ibuprofen. A post-workout recovery booster. With all these benefits, we must be talking about none other than cannabidiol (CBD). It’s been the subject of multiple professional sports arguments for years. Does using cannabis, or one of its well-known compounds, CBD, help with injury and the healing process? Should professional athletes be allowed to use it in the sporting world? For those who are looking for natural relief from pain caused by sports-related injuries, an overly active lifestyle, or other injuries, CBD products are gaining popularity. 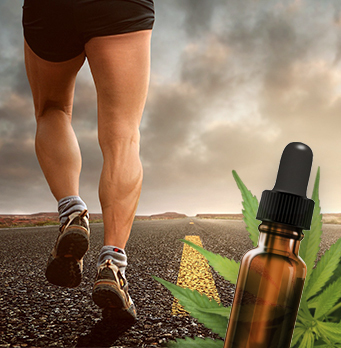 There are already many athletes, including those in the running/ultramarathon community, who consider CBD to be an important part of their regime. Athletes, especially runners, are no stranger to overuse injuries and chronic pain. The chronic pain that is experienced by many athletes usually develops slowly, is long-lasting, and is persistent. Chronic pain is typically low-grade pain and directly linked to an injury, and the pain might sometimes come and go. However, the symptoms should not be ignored and could lead to long-term injuries that are difficult to heal. So without further ado, here’s a little insight into using CBD for injuries and recovery, and what you can expect if you start implementing the natural compound into your routine. Injury is a very broad term – there are multiple ways that one could be inflicted with an injury, but many of course are sport-related. Anyone who has ever been involved in sports is likely to have suffered an injury of some kind or another. Sports are usually physically demanding, and require the body to endure many forms of trauma and stress. In the broadest sense, the term sports injury refers to the types of injuries that most commonly occur during exercise or physical exertion. Although any part of the body could be injured during exercising or sports, the term is typically used to describe injuries that involve the musculoskeletal system – consisting of bones, muscles, and associated tissues, like cartilage. The most common kinds of sports injuries are sprains and strains. Strains are injuries to muscle tendons or fibers, which anchor the muscles to the bones. They’re referred to as “pulled-muscles” because it’s the action of overstretching or overusing the muscle which causes a tear in the fibers or tendons. Sprains are injuries to ligaments – the bands that connect bones in a joint. Stretching ligaments past their limits can suddenly tear or deform them. Other common types of sports injuries include dislocated joints, fractured bones (including the vertebrae), and tears of the tendons that support the joints. Whether an injury is chronic or acute, there’s never a good reason to try to work through it. When you are experiencing pain or other injury-related symptoms, you should try to treat it as soon as possible – whether you use CBD oil or not – to prevent causing any further damage. When a professional athlete suffers an injury, they need to heal as quickly as possible. There’s no time to sit around and wait for things to subside or symptoms to improve; this is their career after all. For the longest time, the way to go for athletes was opioids. The problem is that many athletes found themselves either fighting addiction or noticing their minds or bodies deteriorating. In 2018, the World Anti-Doping Agency (WADA) came to the decision that it was okay for athletes to use CBD. This is something that many professional athletes were advocating for. Injuries, specifically sport-related injuries, no longer have to be an open window to opioid addiction with the newly found acceptance of CBD in the athletic community. Small injuries, such as a sprained ankle, may cause inflammation to develop in the injured area. Inflammation is a necessary healing process. Your brain observes what is going on in this area and sends fluid to help with the healing. The problem is sometimes the inflammation can be too much, and this can get in the way of rehabilitation and recovery. This is the reason a lot of people choose to ice their injuries – to reduce swelling. Using a CBD topical on the affected area can considerably reduce swelling. Because CBD is known to interact with the immune system, it can tell the immune system not to send so many immune cell warriors to the injury. This won’t stop the healing process or slow it down, but may help you to heal it faster. Dealing with chronic pain heavily impacts the quality of life, not to mention the ability to perform at work. Pain is a natural symptom of just about any and every injury. While opioid painkillers are known to mask pain completely, they may put you in a fog, and also give you a false sense of ability when you are in pain or injured. CBD is a much safer and more efficient way to combat pain, and it won’t put you in a fog. Hurting yourself is inevitable – especially in sports. Instead of turning to opioid painkillers like Vicodin or methadone, which will only help with pain, you can treat pain and also speed up your recovery time by using CBD. CBD has been found to treat and improve all kinds of medical diagnoses, from degenerative diseases like Multiple Sclerosis to seizures, and it even has the potential to treat various forms of cancer. If it can help with so many different diseases, then surely it can help with the healing of various injuries that you might sustain. 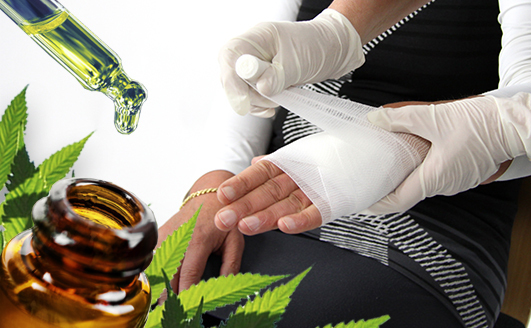 Research on CBD for injuries certainly hasn’t been fast to accumulate, largely due to the skepticism and legal issues surrounding cannabis. However, the market for CBD is still booming. There are also various professional athletes who have spoken out publicly about the positive effects of CBD and how it has helped them with their injuries. For example, former pro cyclist Floyd Landis uses CBD to manage pain that he experiences from a 2006 hip replacement that he underwent. For years he was relying on opioid-based painkillers, but was introduced to CBD in 2015 and hasn’t looked back since. Now he’s an outspoken advocate for the supplement. There is research out there to back up his enthusiasm. A 2008 review that was done by GW pharmaceuticals looked into two decades worth of animal trials and animal trials and concluded that CBD could be a successful tool for managing pain without risking having any adverse side effects. A 2016 study that was done by the University of Kentucky looked at the effects that CBD had on arthritic rats and found that it reduced pain and overall inflammation. There are also studies that have labeled CBD as a neuroprotectant, meaning that it is able to bolster the brain against the traumatic effects of a concussion. Another important study is one done in 2010 and published in the Future Medicinal Chemistry. The study explained that CBD could often be of help by regulating the immune system, as well as suppressing inflammatory responses. Both of these actions provide value preventatively, and in the case of an injury. For thousands of years, cannabis has been used to ease discomfort and relieve pain. However, only recently has the medical community started to embrace its healing capabilities. Many people, including professional athletes and medical experts, have praised the incredible therapeutic potential of CBD, especially when it comes to treating pain. Natural CBD products are undoubtedly of benefit to athletes, along with anyone else who may be looking for a safer, more natural approach to alleviate the symptoms of an injury without the potential hazards that are linked to conventional pharmaceuticals. 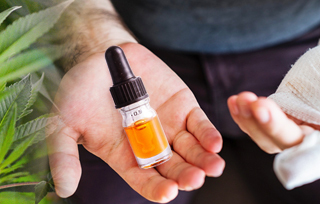 CBD products can be bought in a variety of forms – tinctures, topical applications, and capsules being some of the most popular methods of administration. Which method you choose is all up to a matter of preference. If you are looking to treat pain quickly then taking CBD sublingually is best. Simply place a few drops under your tongue and hold it there for a minute or two. Since the tissue under the tongue is very absorbent, the CBD can get to work in just a few minutes. This is the best method if you are looking for fast-acting effects. If you are looking to treat localized pain or injury, such as cuts, aches, sore joints or muscles then applying CBD topically may be best. The CBD will be absorbed through the pores, so it’s not a fast-acting approach, but the relief can be felt for longer when the CBD does set in. In addition to how to take CBD, there’s also the case of how much and when. In reality, this isn’t an easy question to answer. One of the complex aspects of CBD is that effective dosing can be very different between two people. There isn’t a way to know what dose is right for you until you try it. How much CBD you should take will depend on a variety of things, like how serious your injury is, body weight, and metabolism, among other things. If you are someone who is sensitive to most other medications, then you should start at the lower end of a typical dose. A low dose is considered to be between 5 to 15 mg of CBD – this would be a few drops of a tincture (but also depends on the strength of the product). If you don’t feel any effects after three to five days, you can add another serving of the same amount. There is little doubt that CBD is taking the athletic world by storm. Since WADA officially removed CBD from its banned substances list at the start of 2018, we are bound to see an increasing change in perception of CBD in the years to come. This decision by WADA along with the voices of athletes who are comfortable to speak out about their positive experiences with CBD is likely to do even more to remove the negative stigma that is linked to cannabis use. It sure seems as though CBD could be just what the sporting world needs, and we are only expecting the use of CBD oil for injuries to increase in the years to come. Ramon from Ashburn just bough! Andrea from Ashburn just bough! Angelo from Ashburn just bough!